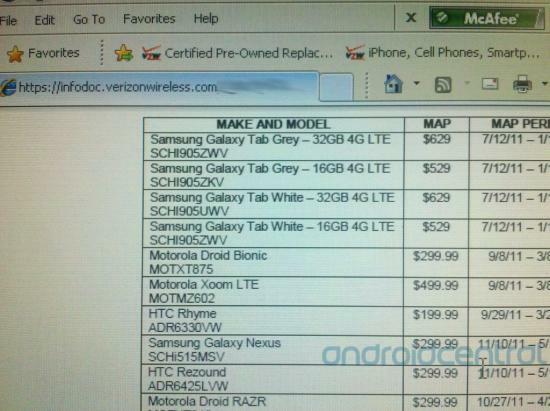 Verizon Galaxy Nexus, HTC Rezound Launching November 10? So, we finally know that Verizon will be (officially) carrying the Galaxy Nexus “later this year,” but we don’t know when. The leaked screenshot you see above might just fill in the blank for us, as it’s pointing to a November 10th launch of the first ICS device. Not much else is known at this point, and none of this has been confirmed anyway. So all we can really do at this point is look at photos and videos of the Galaxy Nexus, at least until more news comes in. It’s also worth noting that the HTC Rezound can be found in the spreadsheet, with the same launch date as the GN. We’ve seen the Rezound here and there, and most recently in another Verizon screenshot, with a rumored launch last week (which obviously didn’t happen). Word on the street is that the Rezound is actually a renamed version of the HTC Vigor, which is supposedly sporting a 1.5GHz dual-core processor, Android 2.3.4, an 8MP rear camera, 2MP front-facing camera, a 4.3-inch 720p display, and LTE capabilities. Admittedly, the Vigor/Rezound does look a bit like the HTC Sensation 4G in terms of the front of the device, and it appears to be running Sense 3.0 as well. Nevertheless, it’s still a gorgeous device. Anyone on Verizon excited to pick up their Galaxy Nexus? 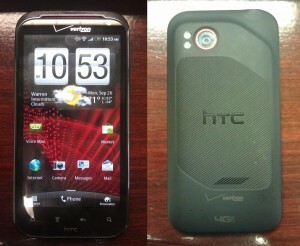 Who’s interested in the HTC Rezound? Drop a comment below!